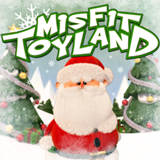 Rival Gaming has just launched a heart-warming new Christmas slot called Misfit Toyland. The nostalgic game has three festive bonus features with Sticky, Expanding and Sinking Wilds. Rival Games aren't available at many casinos -- Slots Capital Casino is one of them. Until the end of December, they're giving all active players 50 free spins on the jolly new game -- and they'll triple your deposits this month! Slots Capital Casino offering 50 free spins on new Christmas game from Rival Gaming. Misfit Toyland has a broken Jack-In-The-Box, a ragged Doll, a Cowboy riding a pig, a Nutcracker with a nut allergy and a square Bubble-blowing Wand on its reels. During regular spins, the Jack-In-The-Box is an expanding wild. When three or more Santa symbols appear, players pick a toy to choose their bonus feature. Choosing the Broken Truck gets free spins with a Sticky Wild. Pick the Jack-in-the-Box and there are Expanding Wilds during free spins. In Sinking Ship free spins, a Sinking Wild expands downward. This new Christmas slot game is an Any-Way-Pays game with 243 possible winning combinations on every spin. All players that have made a deposit in December are eligible. Wagering requirement 60X. Max. cash-out $180. Available until December 31, 2017. Available until December 30th only. Slots Capital’s Advent Calendar continues with daily bonuses until Christmas Eve. Weekdays there are daily deposit bonuses up to 250% that include up to $100 free chips. Weekend dates on the calendar are hiding up to 200 free spins on the casino’s most popular slots (deposits required). Slots Capital welcomes players from all over the world -- new players receive a 277% bonus on their first deposit. The casino has table games, like Blackjack and Roulette, and dozens of slot games from Rival Gaming.